resting on variations of blue taken from lagoon, ocean and cloudless sky. but families or parties of any number will find it comfortable and accommodating. 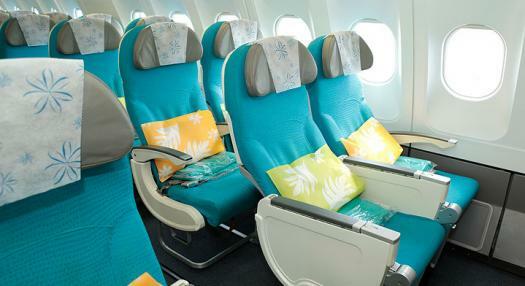 Ergonomics were key in the selection of seats for Moana Economy Class. Our 264 seats are built with strong, lightweight materials to improve overall fuel efficiency without sacrificing support and comfort. Seats recline to a comfortable 118 degrees and a pitch of 32 inches, perfect when viewing your 9-inch high definition screen, loaded with a full assortment of recent release movies, TV shows, music, video games and much more. For your personal electronics, each seat also has a USB power port. For kids whose screen time is up, an amenity kit with games is available. *Due to differences in plane configurations, some variations exist in cabin amenities. 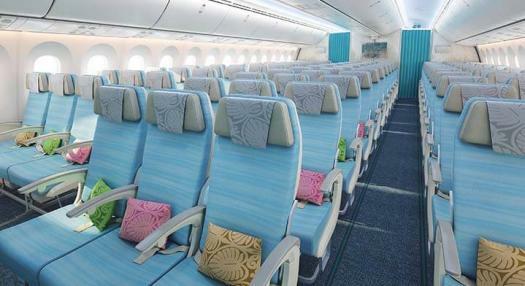 The two Moana Economy class cabins feature a total of 232 seats specially designed for long-haul travel by ZODIAC Aerospace. The Z300’s articulating seat pan makes it one of the best next generation long-range economy class seats available in the industry. 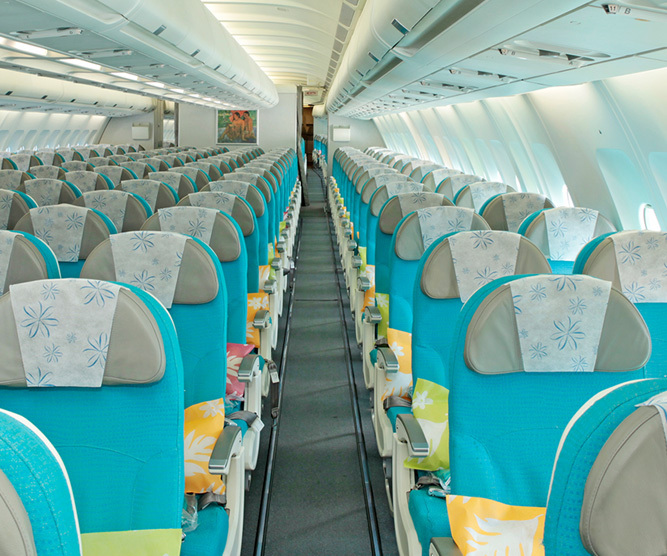 The economy class seats are installed on a nine-abreast (3-3-3) configuration with a pitch of 31 inches offering a seat recline of 6 inches for improved comfort. The onboard amenities include: a comfortable polar blanket, one confortable pillow and a complete kit of personal accessories.